Home > Electronics > Pirated CDs - Is There A Problem? 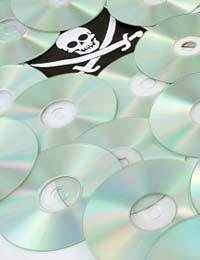 According to estimates, a staggering one-third of all CDs sold in the world are pirated. That's a huge figure, and it means that the record labels, and even more importantly, the artists who made the music, don't see a penny from all those sales. The big profits go to the criminal organisations that put out these pirates. They're a massive business all across Asia, but you can find them quite easily in every country in the world. Some are done well, others are obvious, cheap fakes. But when copying a CD is very quick and easy, it's no surprise that counterfeiters have been quick to step in and take advantage. Just after the Millennium, in fact, it was discovered that some British high street stores were selling pirated CDs, even though they didn't know it - their distributors in Europe had been infiltrated. What Is A Pirated CD? A pirated CD is an illegal copy of a CD that's offered for sale at regular retail prices. No royalties are paid to artists and composers. Much like real commercial recordings, they're produced on duplicators which can churn out thousands of copies very easily - since everything is digital, there's no problem with that; the copy will sound just like the original. That said, the low-end counterfeiters will use CD-R discs (some of which have a greenish tint to the playing side, which distinguishes them from proper CDs) and printed labels on the disc, or even laser printing as opposed to the "real" printing. These are very easy to pick out at a glance. About the only area which can cause the counterfeiters problems is the cover. But in most cases it's something they've surmounted, often by scanning and printing - although the booklets won't have the same glossy sheen you'll find in the real thing, since they have no incentive to invest in more expensive paper stock. At the low end there might be no booklet at all or simply something cheaply photocopied, where the quality is quite obviously inferior and easily spotted. You'll find pirated CDs for sale on online auction sites (with no chance to inspect beforehand, there's no way you can tell before you buy) and at places like car boot sales, which are fairly unregulated. Some market traders may carry them, but Trading Standards are alert to the problem, and with the possibility of prosecution, it's a brave trader these days who will deal in quantities of pirated CDs. In a word, yes. Many people believe CDs are too expensive, and that by buying cheaper versions they're making a stand. They're not really, they're simply feeding money into criminal enterprises and making sure that people involved with the CD - never mind the record labels, that also means the artists, musicians, arrangers, composers and so on who might receive royalties for the work - are seeing nothing for the effort they've put in. With the huge trade in pirated CDs, that can amount to many thousands of pounds per person. When people buy pirated versions they're essentially robbing those people. The counterfeiters aren't Robin Hoods, they're raking it in - and nothing's going to the poor. For a relatively small investment in equipment they stand to make an awful lot of money.